Preamble. When the world was younger, and when we were younger, too, we spoke to each other across a vast network of temperate glass cubicles, their wires snaking out beneath the dirt and the pavement for oceans of miles. 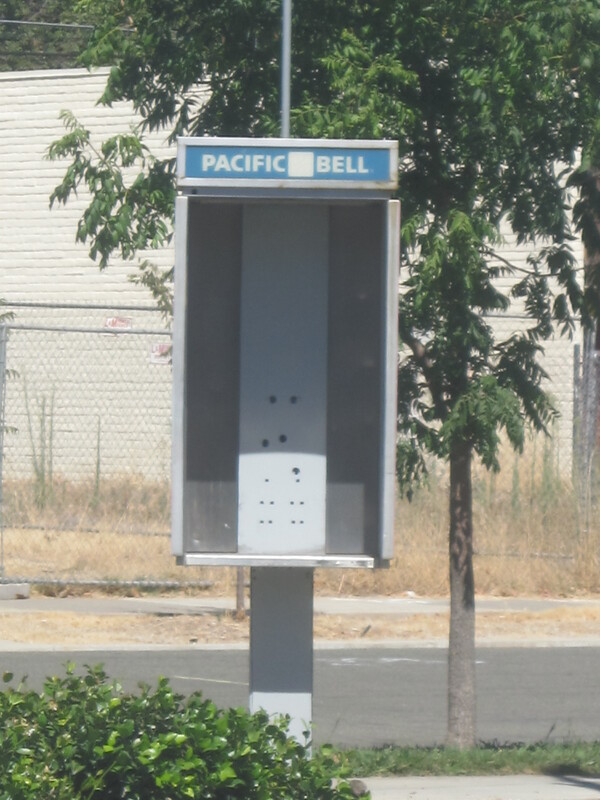 Phone booths were our blessed touchstones as we roamed far and wide – these sturdy, sidewalk sentries linked us irrefutably. They were our teleportation devices, the final proof of extensionality we required to leave home instead of doubling back in terror. And as we left, they became the umbilical cord that might tug us backwards, a blipping, blinking trail of breadcrumb that pointed at our shared history. Just in case. 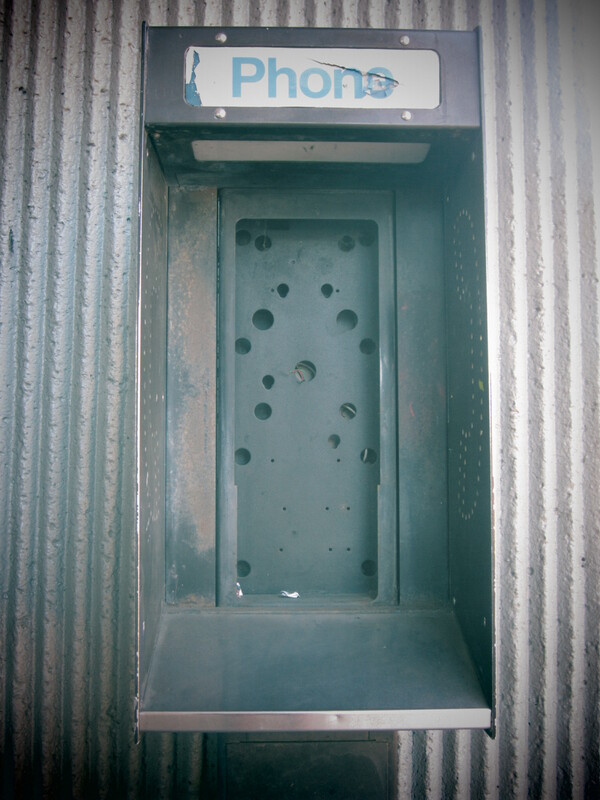 Phone booths lengthened the reach of our eyes, ears, hands, memories, until we stretched comfortably out into cool infinity. We grew. Origins. 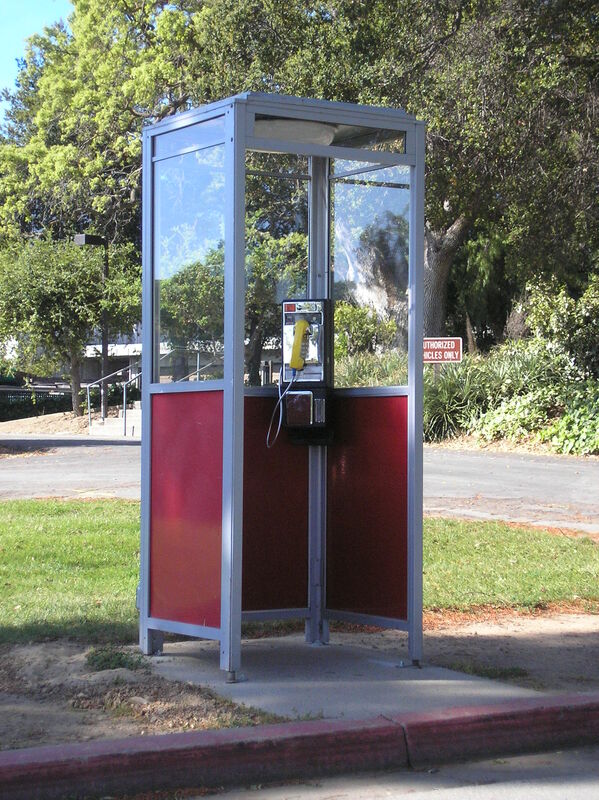 Phone booths originated in Connecticut at the end of the 19th century. You paid when you finished your call. It was a revelation. Within 15 years, they’d multiplied and mutated. There were 81,000 in the United States alone at one point. By now, the lion’s share of these old conjuring booths have been abandoned, though many haven’t yet been dismantled. They are metal-and-plastic dinosaurs of the defunct Industrial Age, relics among us. Connections. When I was 15, and attending private school, I went out with a juvenile delinquent named Andy Rowland. At lunchtime, I’d call him from a payphone in the corner of our school’s courtyard. Just to say hello, and because I didn’t have any friends to eat with anyway. Andy was on house arrest, and my parents disapproved of our budding romance, so we conducted most of our relationship by pay phone. Every week or two, he’d get sent back to juvenile delinquent hall and his mother would answer the phone instead of him when I rang. Her voice sounded old and poor. A month or so back, on a lark, I looked up Andy on Facebook. He’s in grown-up prison, now, for stealing cars, and in his profile pic, he’s posing with his daughter on visiting day. Their bodies are separated by a glass partition, a serpentine phone cord snaking between them. Her hand is on the partition. He looks indescribably sad. She looks just like him. I didn’t call anybody from those phones, because the only person I could think to call didn’t want my voice anymore. I knew that. So I took a picture and climbed the mountain instead. It was a long ways up. Cinematic turns. In a turnkey scene from the ’90s comedy, “Dumb and Dumber,” a thick-necked mobster stands in a phone booth outside a dumpy restaurant, updating his boss on the latest chapter in an extortion-gone-wrong. Just outside the booth, a small, wormy man paces back and forth, irate. “Get off the phone!” Wormy Man screeches. He motions for Wormy to speak up – he cannot quite hear. In a tinkle of shattering glass, Mobster’s fat fist flies through the plated phone booth door, straight into Wormy’s face. Wormy flies backwards and hits the pavement, out for the count. We used to have to wait our turn. Transformations. Superman was famous for changing clothes in tiny phone booths. 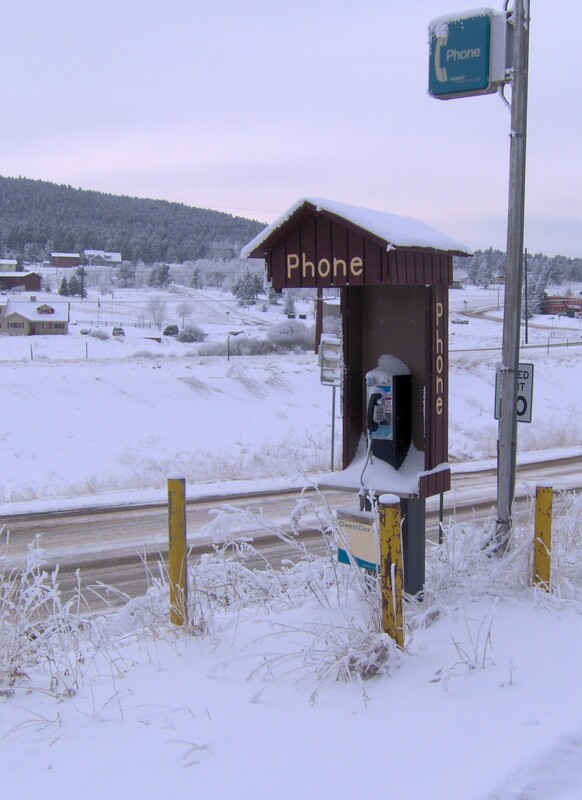 Phone booths are a place where we can transform ourselves in many ways, and because of this, the payphone booth can be understood as an in-between place. It’s less private than a toilet, but it’s more private than a park bench. They are a place where we can pretend nobody is looking. The glass enclosure feels protective, benevolent, almost motherly. But it is, of course, an illusion. Whether inside or outside its rectangular confines, we are equally exposed. Revelations. At the end of the world, you called me from a payphone. I was in Korea. You were in Colombia, in a café, in a little wooden phone booth, you said. Just a partition, really. And you knew that you’d start crying if you talked, and you knew that everyone would hear you if you cried. So you didn’t talk, and I cried for both of us, the line blipping and cutting out. No sounds but me sniveling pathetically and the sinister Ding! of the café door opening and closing, again and again, until the line went dead. I stayed up all night. You never called back. Sometimes, silence is bigger than sound. What happened next. In Mexico City last winter, I was heartened to see a fashionable young woman in false eyelashes drop some pesos into a payphone in a subway station. Maybe some vestiges of the old ways still remained? I watched her dial, wait, and begin to speak rapidly. And it was then that I noticed a black iPhone cradled in her limp, manicured fist, like a dead hamster or an injunction. This, too, was temporary. Artistic turns. In these end times, the phone booth has become something of an abandoned third space, and artists have always dug abandoned third spaces. Phone booths have been reimagined into saunas in Sweden, miniature shrines and museums in Asia, and the entrances to secret speakeasy bars in New York City and Chicago. It begs one question: What do we have that is worth saving? The homeless. Two years ago, I went on a date with a guy who wore ratty sweaters and was setting up a phone company for bums. His ad-hoc framework consisted of an old telephone resting on a table in his front yard that was connected to a phone line that was connected to the Internet. Homeless people could use the phone to leave and retrieve voicemail messages. “Bums have business to take care of, too,” he said. Those concerned about the recent hijinks of the NSA might well consider reverting to analogue communication devices. At least there’s a precedent. In Summation. Phone booths were the provenance: of gangsters, of the lonely, the desperate, the clever, the smitten, the luckless and the horrified. Now, those people have found new places to live. Now, we keep company with ghosts. Have a vignette to add? Comment below, friends! Writing Resolution for 2015: Let’s All Stop Arguing with Our To-Do Lists, Shall We? They’re such relics, seeing one is always a little startling. Yes, it’s almost awkward. Like seeing an ex or something. Most of the time, you just pretend you didn’t.